The exhibition Zoo Humains. 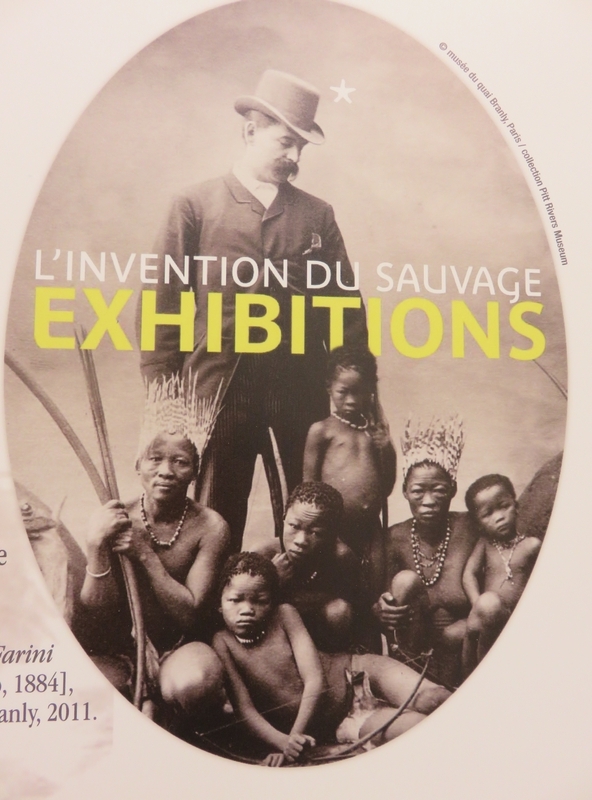 L’invention du sauvage (Human Zoos. The invention of the savage) ran from September 2016 til the end of February 2017. We visited a week before it closed. 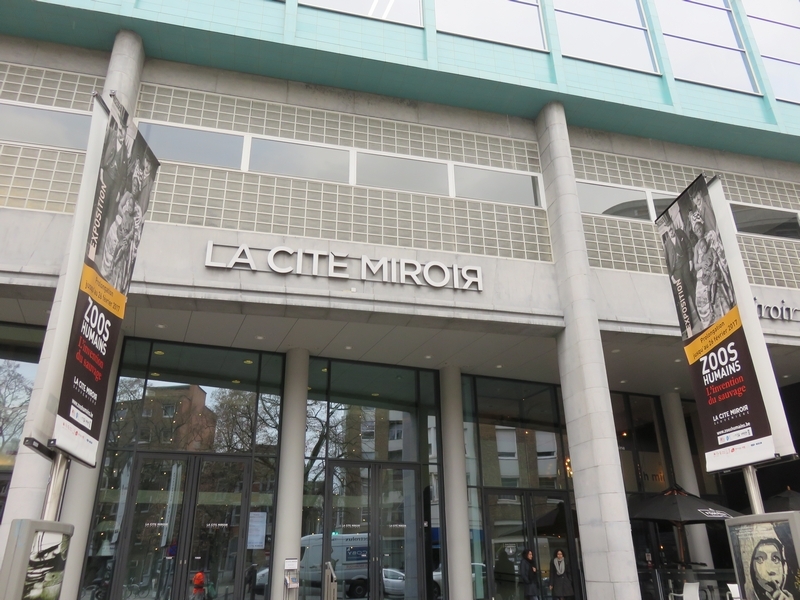 It was in La Cité Miroir in Liège, a nicely renovated building, that used to house a swimming pool. Before our visit to the exhibition, we had lunch at Como en Casa, a nice vegetarian restaurant, and we also visited the GoVeg Vegan shop. For more than five centuries, the industry of human exhibitions fascinated more than 1 billion 400 million visitors and put on display between 30.000 en 35.000 figurantes in spectacle shows, all around the world. These spectacles, being the first visual contact between cultures, have drawn a divide and a hierarchy between the so called “civilised” and the “savages” in the minds of westerners. At Zoos Humains, visitors learn how racist prejudices became installed during the times of the great colonial empires. Racism is above all a mental construct. 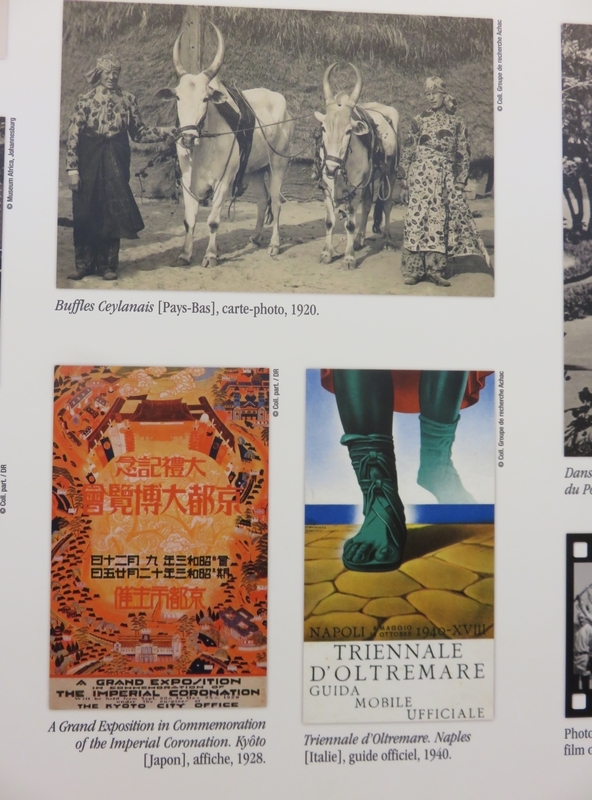 The exhibition invites everyone to be aware of the fact that History has influenced us, from generation to generation, to see ourselves in first respect as Blacks, Whites, Maghreb or Asian. 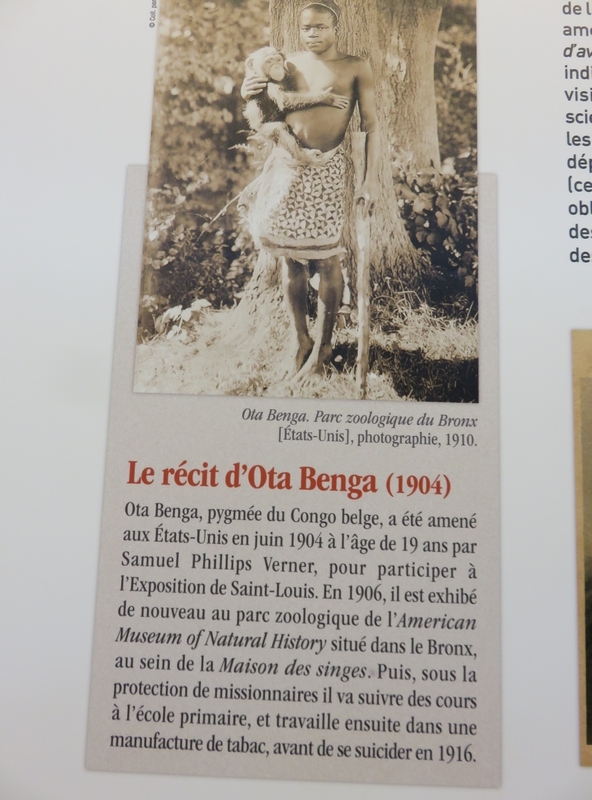 This exhibition originated from the wish to better understand the origins and the construction mechanisms of discrimination and stereotypes, 110 years after the first universal exposition in Liège in 1905, where the colonial European countries displayed their colonies“. 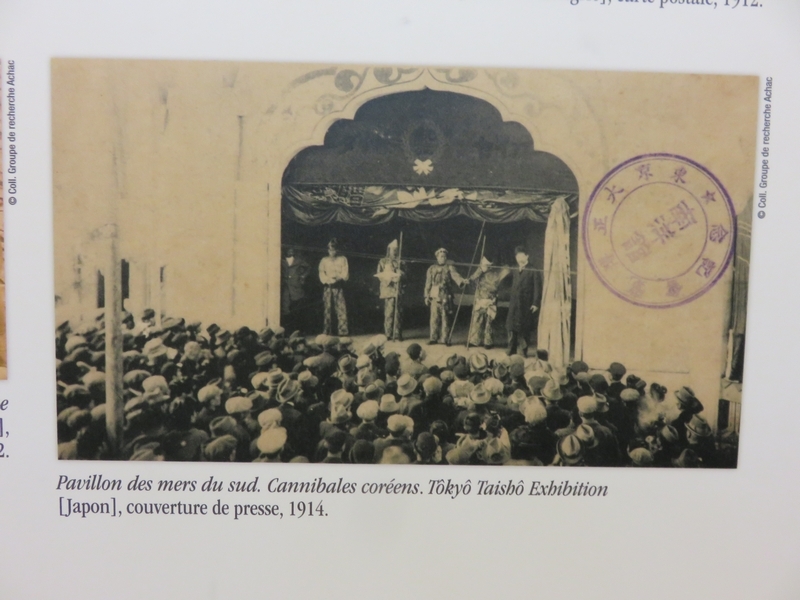 It was a very interesting exhibition, documenting the wide variety of locations (from theaters to gardens, and circusses to fairs), performances (people making artefacts, fighting, singing, dancing, …), and variety of ethnicities involved. 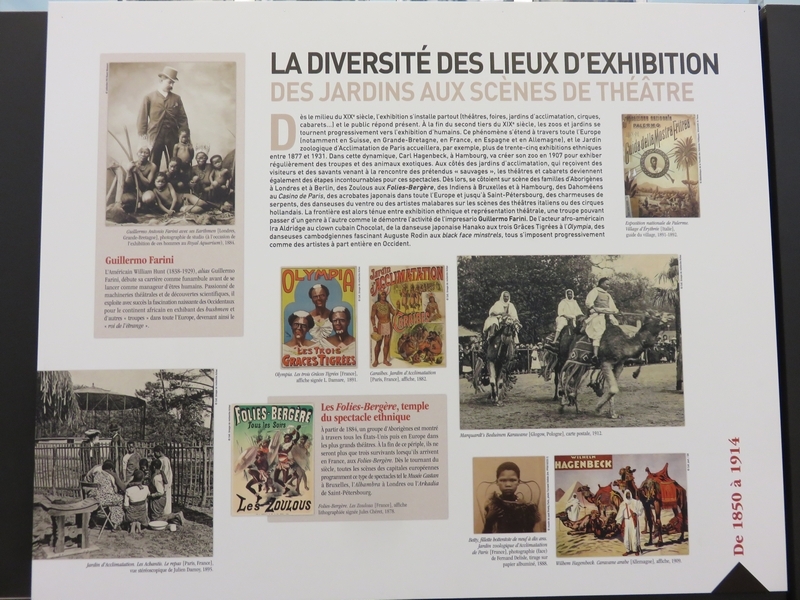 The exhibition is mainly built on information from official archives and shows lots of photographs and posters from human zoos, its visitors and participants. The voices of the ‘participants’ themselves appear to be scantly documented, with few diaries, interviews or other documents recounting their life on tour (or thereafter, when their bodies were sometimes added to the ‘collection’ of natural history museums). 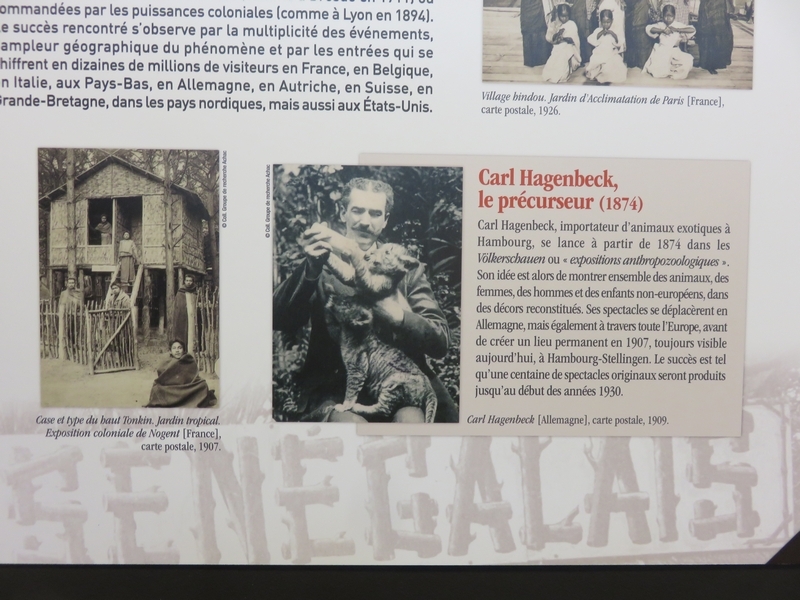 One example being the dairy of Inuit Abraham Ulrike, who signed up for Carl Hagenbecks shows in Europe, and died on tour together with several family members because they were not vaccinated against small pox. 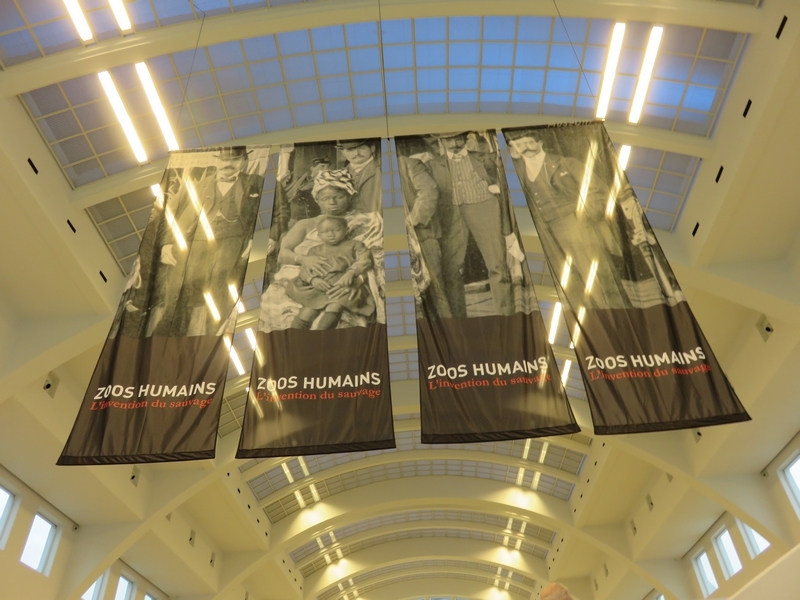 The exhibition Zoos Humains never thoroughly examines the link with animal zoos. 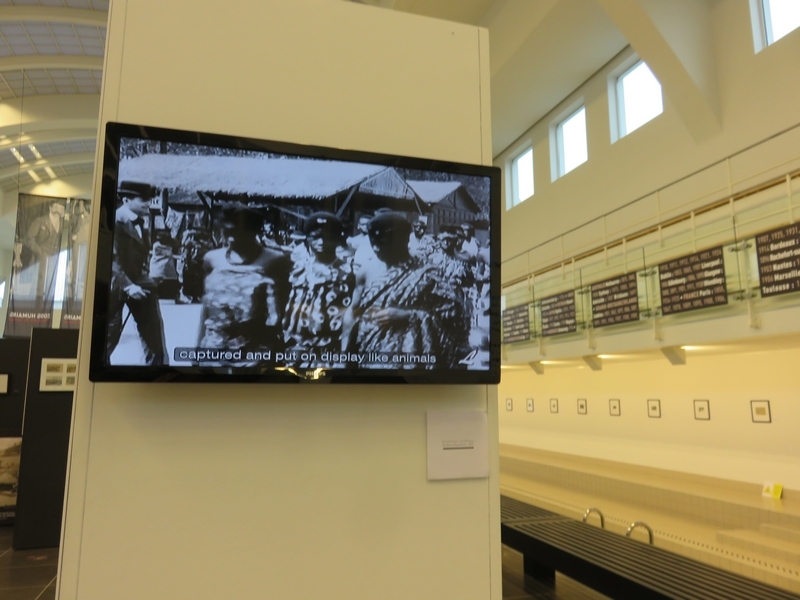 There is a brief reference to the treatment of animals during a short video shown at the exhibition (see below). 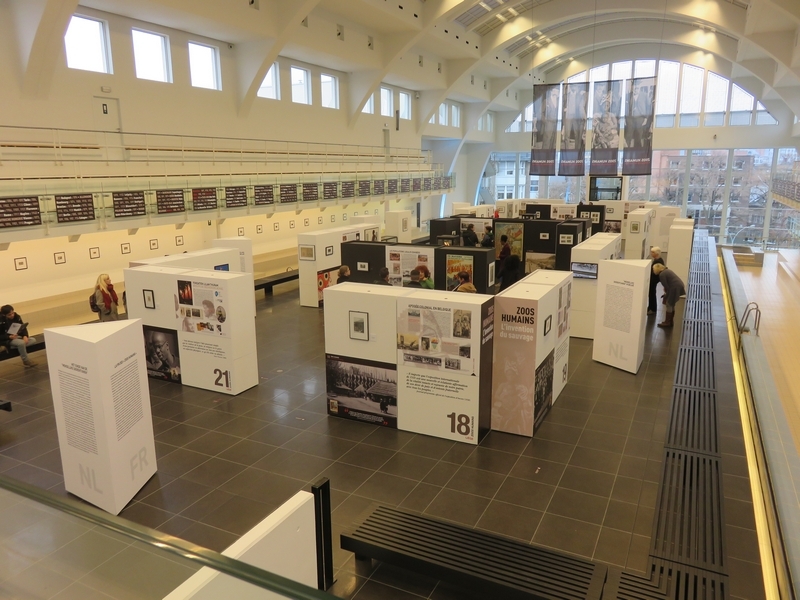 Quote from video: “In less than ten years, exhibitions transformed from a few individuals, captured and put on display like animals, to organised troupes of hundreds of individuals who were recruited en masse from all around the world” (my emphasis). This video was shown at the exhibition (French spoken, English subtitles made by Rachid Bouchareb, scenario by Pascal Blanchard and Rachid Bouchareb, 2009). 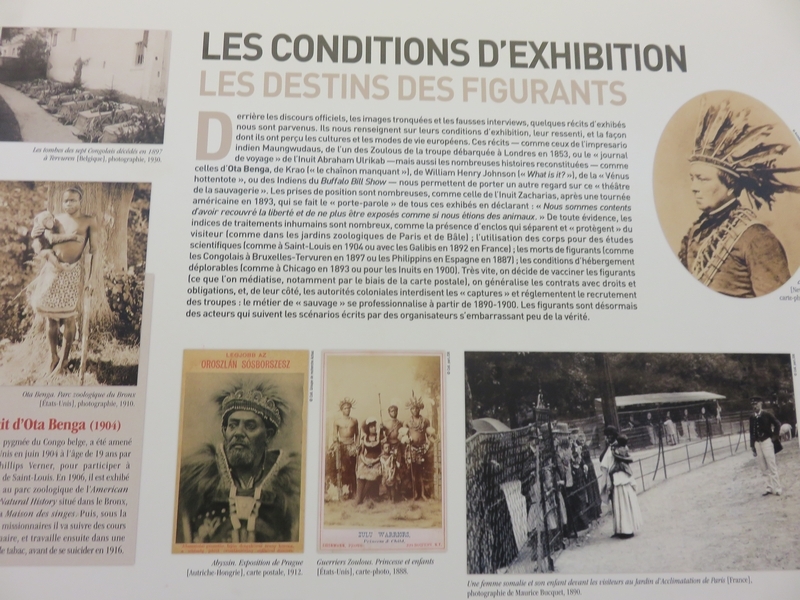 And also in the above pictured info chart, about the working conditions of those on display, where Inuit Zacharias is quoted, after a tour in North America in 1893: “Nous sommes content d’avoir recouvré la liberté et de ne plus être exposés comme si nous étions des animaux“. (‘We are happy to have found our freedom again, and to no longer being put on display like animals’). 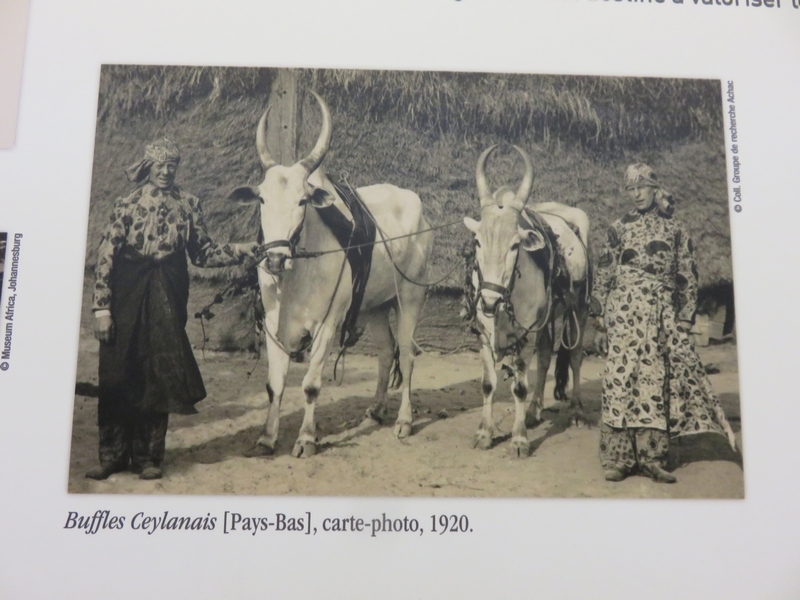 On some of the photos shown at the Human Zoos exhibition, one can also see animals included in the exhibitions (chimpansees, camels, buffalos) or a reference to animals (eg. 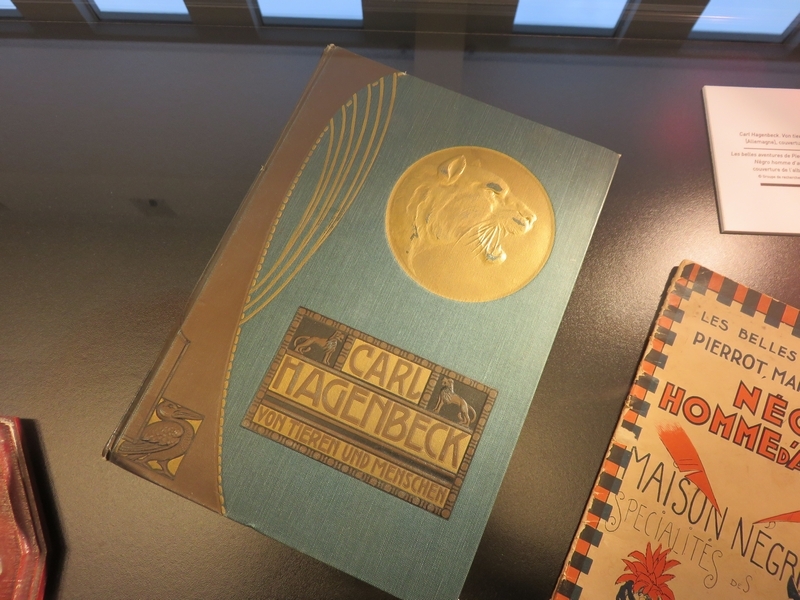 the book from Carl Hagenbeck). Book ‘Von Tieren und Menschen‘ (‘About animals and humans’, 1908) from Carl Hagenbeck. German Hagenbeck started as a collector and importer of exotic animals, and later on also included humans in his exhibitions, with whom he toured through Europe and America. Animal ‘menageries’ and animal zoos were also very popular in the 19th century and – where they used to be the privilige of royalties and upper classes, were gradually made accessible to the larger public. 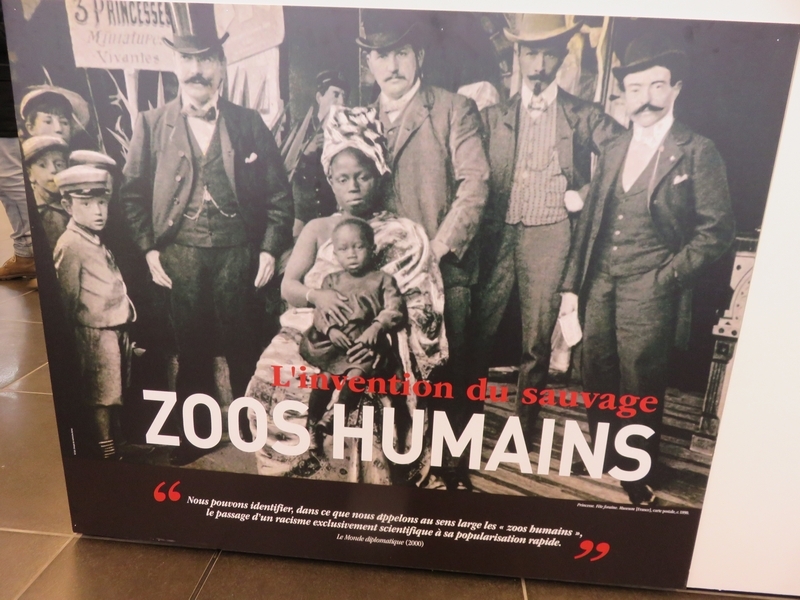 As human zoos installed the idea of ‘non-westerners’ as ‘savages and others‘, animal zoos also installed and still perpetuate the idea of animals as the wild, the other, the inferior. 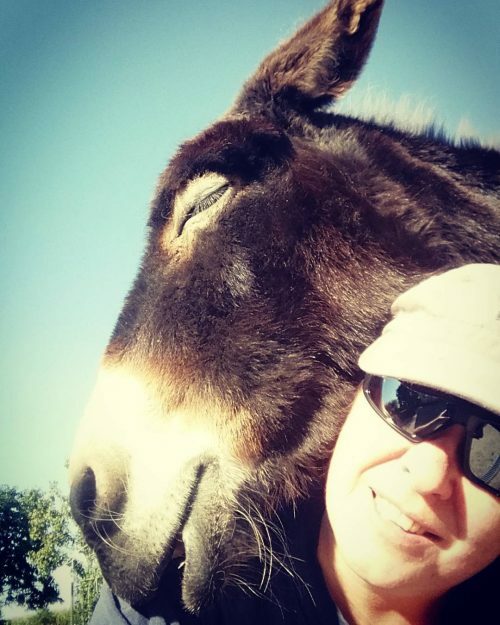 As magnificent and wild beings to be gazed at, staring at them in wonder. And we humans looking at them, as superior creatures, further building upon ànd constructing our speciesist look at animals. A follow up exhibition highlighting these parallels, and the interconnecting mechanisms of speciesism and racism , and how we can deconstruct these mechanisms of discrimination, would be very interesting. Sept 17 2016 – February 26, 2017. 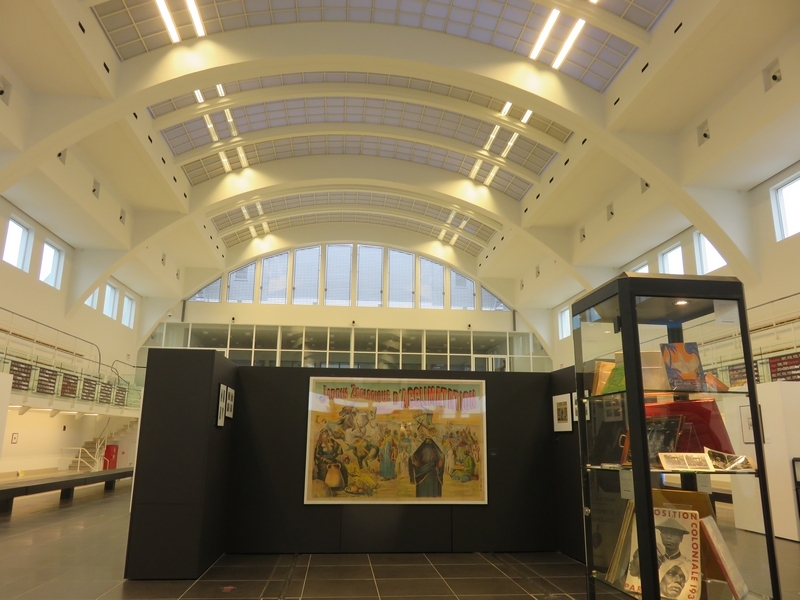 The exhibition was organised by the Lilian Thuram Foundation – Education against racism and Achac (Association pour la Connaissance de l’Histoire de l’Afrique Contemporaine). 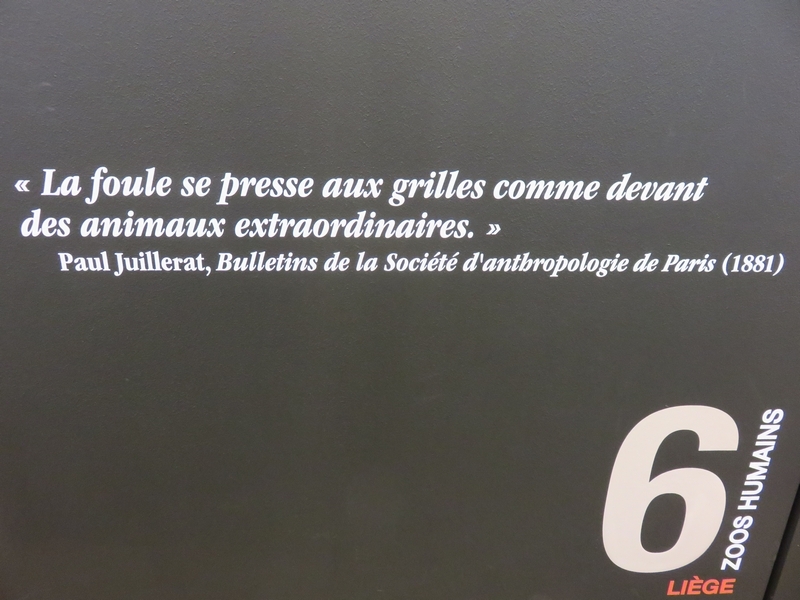 It was previously shown in 2011-2012 in Musée du Quai Branly in Paris. 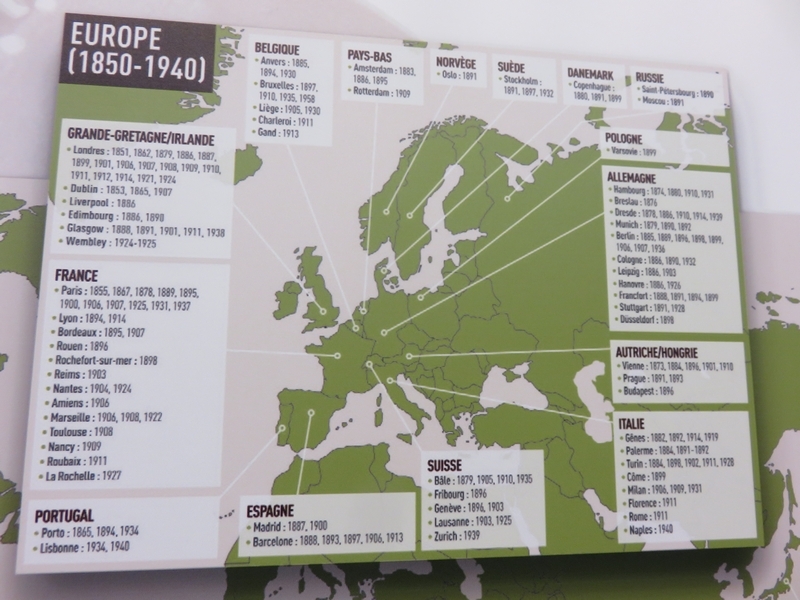 For the exhibition in Liège, it was adapted with specific material about the Belgian history concerning this matter.